Following the positive experience Dubois Naval Architects are having with Feadship in the two 46m designs currently under construction, Feadship has asked the studio to develop a 90m project. Ed Dubois says, 'The main exterior feature is a powerful sheer with a slight drop at the bow hinting, we believe, at speed and practicality. The strong sweep downwards towards the saloon allows good visibility from this area and the "haunch" at about thirty per cent aft from the bow lends the feeling of a powerful and extremely capable vessel. We have sought to convey a message of a "living" vessel, with a deep source of animated energy. 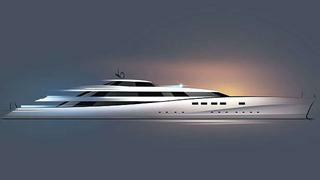 'The interior design is being developed in conjunction with Feadship and will incorporate a very easy flow from one space to the next and excellent visibility from all areas,' he continues.